Hubble, Edwin Powell (1936). The Realm of the Nebulae. New Haven. Hubble, Edwin Powell (1937). The Observational Approach to Cosmology. Oxford. ^ Gale E. Christianson (1996). 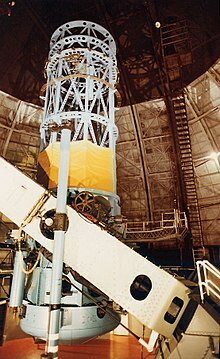 Edwin Hubble: mariner of the nebulae. University of Chicago Press. p. 362. "Grace heard that Enrico Fermi and Subrahmanyan Chandrasekhar, both members of the Nobel Committee, had joined their colleagues in unanimously voting Hubble the prize in physics, a rumor later confirmed by the astronomers Geoffrey and Margaret Burbidge after speaking with "Chandra"."